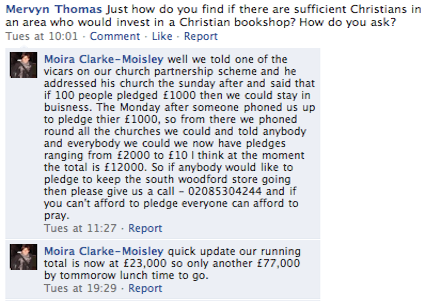 Just how do you find if there are sufficient Christians in an area who would invest in a Christian bookshop? How do you ask? well we told one of the vicars on our church partnership scheme and he addressed his church the sunday after and said that if 100 people pledged £1000 then we could stay in buisness. The Monday after someone phoned us up to pledge thier £1000, so from there we phoned round all the churches we could and told anybody and everybody we could we now have pledges ranging from £2000 to £10 I think at the moment the total is £12000. So if anybody would like to pledge to keep the south woodford store going then please give us a call – 02085304244 and if you can’t afford to pledge everyone can afford to pray. quick update our running total is now at £23,000 so only another £77,000 by tommorow lunch time to go. Please make a note of that number, 020 8530 4244, spread the word and, if you’d like to make a pledge, give them a call. In the meantime, the Edinburgh branch — which first broke the news on facebook that the company was going into administration — have launched an in-store and online petition in a bid to convince prospective investors that there is sufficient interest to warrant supporting the shop. At the time of writing the online petition has 20 signatories. If you live in or around Edinburgh and see the shop as an important resource to the local community, please call in and sign it; and if you can’t get there in person, please consider signing the online petition. Wonder if anyone knows what is happening to the CARLISLE Wesley Owen? Hi Andrew – you may find this post interesting: The Future Shape of Christian Bookselling — includes links to lots of other discussions, in particular Clayboy’s The end of Christian bookshops? What, though, would Waterstones look like if the contents of the now (about to be) closed Wesley Owen, and the closed a while back SPCK, both of which were substantial, were decanted onto its shelves. There is a sufficient market to make a full theology and religion section viable in larger stores, and a couple of decent-sized bookcases in smaller ones. The larger stores at least might even start employing staff with specialist knowledge. However had they been asked at point of application for the job or on the job about their religious affiliation this would be in direct breach of employment law, and to my way of thinking is as it should be. Also all secular bookshops I am aware of already sell christian books, that is to say they carry the Bible, Karen Armstrong, Joel Osteen and a range of other popular and well selling books – these are the books they will tell you that they have a market for – and given that most secular bookshops have a strict policy for turnover per sq ft of shelf space you may find they are rightly resistant to increase this range on the whole due to economic considerations. However I do agree that there is some meat to your friends suggestion in one respect and that is based upon the fact that my shop is both a general and christian bookshop, and this is something I would suggest more independent christian bookshops consider doing – carrying a diversity of range to appeal to a wider base of customer so as to increase the viability of the business. However I do not think that you would ever find the range of books to be stocked in the majority of secular bookshops as you will ever find in a dedicated christian bookshop or specialist stockist – this is just a matter of base economics and specialisation.